Nancy Huston is a Canadian writer who has published award-winning French novels including: Les variations Goldberg (1981), Cantique des Plaines (1993), La virevolte (1994), and Instruments des ténèbres (1996). She lives in Paris and is well-known for her practice of translating her own work into English, so the four titles above have English versions in print. See the bibliography below. Nancy Huston was born in Calgary, Alberta, in 1953. When she was six her mother left the family. Her father took guardianship of Nancy, her older brother and younger sister. Her stepmother took her to Germany for some months. When she was fifteen the family moved to Wilton, New Hampshire, U.S.A. She attended Sarah Lawrence College in New York and found that she had an aptitude for French and so spend the year 1973 studying in Paris. During her year in Paris she decided to remain in France, enrolled in the Ecole des hautes études en sciences sociales, and completed her MA under the direction of Roland Barthes, a scholar of language theory. Huston began writing for French feminist journals. In 1979 she married language philosopher Tzvetan Todorov and had two children. They divorced in 2014 and her partner is now Swiss painter, Guy Oberson. 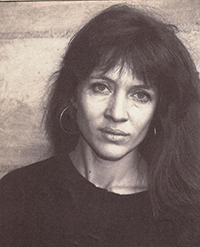 Huston’s first novel Les Variations Goldberg (1981) was awarded the Prix Counterpoint and shortlisted for the Prix Femina. Her first English work was Plainsong (1993), but it was turned down by her English publishers so she translated it into French and discovered that this process improved the text. Cantique des plaines was published before the English version in 1993 and won the Governor General’s Award for French Fiction that year and the Prix Canada-Suisse in 1995. From this point Huston has used the process of self-translation for all her novels and has also translated some of her essay collections such as Nord Perdu (1999) and L’espece fabulatrice (2008) as The Tail Tellers (2008). By 2016 she had published 14 French novels most of which she also translated into English. Her oeuvre includes plays, children’s literature and 12 books of non-fiction. In the personal essays in Losing North: Musings on Land, Tongue and Self (2002) Huston openly discusses her conflicted relationships with both her mother tongue, English and her adopted language, French. Recognition has come to Huston in the form of many literary awards in Europe and in Canada as well as academic studies of her literary works and her process of self-translation. She is considered a feminist writer in both France and Canada.